They are extremely comfortable together. Chris is really into Emily. Time for dinner and Emily brings out the questions. She is concerned Chris is only 25 and fears he is not ready to be a dad. Meanwhile back at the ranch, Tony starts his breakdown. Then they go to a Luke Bryan concert. Chris asks Emily if he can kiss her, and she tells him to try. All of these people come to the dance floor and I really thought it was going to be a flash mob. It wasn’t, womp womp. Chris seems a little to good to be true. Chris and Emily after scaling the wall. Group Date: Emily surprises her friends and the guys. The guys are excited to see Emily and think this date will be a walk in the park. Emily shocks her friends and tells them they are meeting her boys. Interviews and the friends get to grill them? Why do they not do this every season? Travis brings Shelly the egg. I love it! The blonde is one tough cookie. Wolf guy said, “my girlfriend told me to apply.” What a girlfriend? This is only the third week. Sean is very cute, the friends LOVE him. If he isn’t on the next episode, I fear her blonde friend nabbed him. They have him take off his shirt and do push-ups. Come on this is the show I know and love. “Sean is a genetic gift to the world,”said, Emily’s blonde interrogating friend. Emily's blonde friend loving on Sean. Ryan interrupts girl talk and implies, he will not like her if she is fat. How would she be pregnant around him? Sean and Emily have a fabulous talk. They have a true connection, he is a good ole southern boy. Not to mention, they would have beautiful children. Tony has a meltdown, and the viewer knows it is going to get worse. Emily sends Tony home, because it is what is best for him, her and my sanity. Ryan wants the rose, but he does not need it for reassurance. I have been waiting for this one-on-one since the beginning of the season. Arie and Emily are equally as beautiful. Hello Dollywood! Arie says, he didn’t know Dolly was into that kind of thing. I didn’t know Arie knew anything about Dolly Parton. Emily and Arie off to see Dolly. This was Emily’s first time on a “super serious roller coaster.” Props to her, I would have died on that ride, but Arie said for her to look at him. Emily is so excited to see Dolly. I love how happy she is, with Dolly and Arie. At dinner, Arie confirms he is ready to be a dad. Emily grabs the rose, and gives me, Arie and America a heart attack. She played a joke on him, acting like she wasn’t going to give him a rose. Arie didn’t ask to kiss her, he just went for it. They seem very connected, and kissed a lot. Their relationship reminds me a lot of Ashley and J.P.
Emily and Arie at dinner. Emily steals Kalon away, the previews convey this will be good. Over the last few days, somehow Kalon developed an astigmatism and needs glasses. Kalon believes his first child would be “his.” She compares the situation to his mom, and he said, “I love it when you talk, but please let me finish.” Seriously? I’m sure that doesn’t take him long. I don’t like tall, skinny and condescending. Travis brings Shelly out, and lets Emily smash him. I really enjoyed this antic, and am sad to see Shelly go. He really does seem like a great guy. Alessandro talks to Emily and this is one of the most entertaining conversations in Bachelorette history. He said, “take that compromise” when talking about Ricki. This is a train wreck! Emily wants a guy to think it is an honor, as they should. Alessandro didn’t even try to play the language card. He is truly that clueless. Emily escorts him out, and on he went. “I’m living like a gypsy king,” Alessandro. Wow. 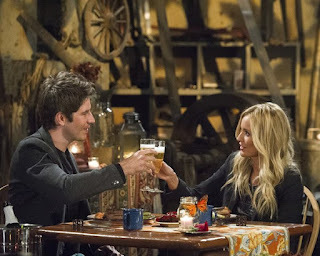 Arie finds time with her and he tells her to think about their date. He gives her a hug and kisses her forehead. They are so sweet. She kept kissing him, and I thought the guys might die. Sean missed her, and wouldn’t have played a game with her. This is good, she doesn’t need drama. Sean confirms he is ready to be a father to Ricki, and how Ricki would be his child no matter what she called him. Then they made out. Can we just cut it down to Sean, Arie and Jef? No rose for Stevie, but I would bet you have seen your first Bachelor Pad contestant from this season. Kalon looked too happy! Next week, we have boat races, Bermuda and Arie. It looks like we have some feuds forming. Chris versus Doug and Arie versus Ryan. Alessandro tells about his long relationship with his 3rd cousin, he has cheated, and still thinks about her. I have no words for this moment.